For other uses, see Tim McGraw (disambiguation). Samuel Timothy McGraw was born in Delhi, Louisiana, the only child of Elizabeth "Betty" Ann D'Agostino (b. 1950), a waitress, and Frank Edwin "Tug" McGraw Jr. (1944-2004), a star pitcher for the New York Mets and the Philadelphia Phillies. McGraw is of Italian and Irish descent, on his mother's side, and of Scots-Irish, English, Scottish, Swiss, Dutch, Czech, and German descent on his father's side. In 1966, Tug was a pitcher for the Jacksonville Suns, and he lived in an apartment above Betty D'Agostino, who attended Terry Parker High School. The pair had a relationship, and when Betty became pregnant, her parents sent her to Louisiana to live with relatives and to have the baby. 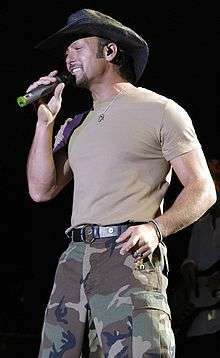 McGraw came to the attention of Curb Records in 1990. After cutting a demo single, McGraw gave a copy to his father. A man who was friends with Curb Records executives heard the demo while driving with Tug one day and recommended that Curb contact the young singer. Several weeks later, he was able to play his tape for Curb executives, after which they signed him to a recording contract. McGraw's first single, "What Room Was the Holiday In", was released on March 29, 1991, and did not enter the Billboard Hot Country Songs charts upon its release. In a 2001 retrospective on McGraw's career in Billboard, a former program director for Nashville station WSM-FM said that he added the song to the station's playlist because it showed "undeniable promise", while another former program director at WXTU in Philadelphia, Pennsylvania recalled that McGraw's debut single was "terrible" but that he booked the singer to make an appearance at the station due to his father's fame. Three more singles were released from Tim McGraw: "Welcome to the Club", "Memory Lane", and "Two Steppin' Mind", although none of these made top 40, and the album itself did not chart. Both "Memory Lane" and "Tears in the Rain", another cut from the album, were co-written by Joe Diffie, and the former originally appeared on Keith Palmer's self-titled 1991 debut album. On August 10, 2015, McGraw released a new single to digital retailers, titled "Top of the World", which was later released to radio on August 17, 2015 as the lead single to his third studio album for Big Machine Records. On September 17, McGraw announced that the album was titled Damn Country Music, with a release date scheduled for November 6. The album's second single, "Humble and Kind", released to country radio on February 1, 2016 and went on to reach number 1 on the Billboard Hot Country charts. McGraw was selected as one of 30 artists to perform on "Forever Country", a mash-up track of Take Me Home, Country Roads, On the Road Again and I Will Always Love You which celebrates 50 years of the CMA Awards. On October 4, 2016, during a show at the Ryman Auditorium, McGraw and Hill announced that they would be going back on the road together again on the 2017 Soul2Soul World Tour. It is will begin April 7, 2017, in New Orleans. McGraw is married to fellow country music singer Faith Hill. Together, they have three daughters: Gracie Katherine (b. 1997), Maggie Elizabeth (b. 1998) and Audrey Caroline (b. 2001). ↑ "Tim McGraw". Curb Records. Retrieved April 23, 2007. ↑ Marra, Amber (February 5, 2011). "Country superstar McGraw learns of his Belle Grove roots". The Northern Virginia Daily. Retrieved March 3, 2012. 1 2 3 4 5 6 "Interviews with Joe Biden, Chuck Hagel, Tim McGraw". Larry King Live: CNN. December 10, 2002. 1 2 "Tim's mom survives, has a new dream". The Florida Times-Union. Jacksonville. April 23, 2004. Retrieved March 3, 2012. 1 2 3 4 5 6 7 8 9 Huey, Steve. "Tim McGraw biography". Allmusic. Retrieved 18 August 2014. ↑ "History & Records: All-Time Roster". 2013 ULM Baseball Guide. ULM Warhawks Athletics. pp. 74–76. Retrieved November 24, 2013. ↑ "What's different about Pike?". Pi Kappa Alpha Fraternity, Kappa Psi Chapter. Retrieved March 15, 2007. 1 2 Jessen, Wade (6 October 2001). "A Record-Breaking Career". Billboard: 28, 34. ↑ "At 39, Tim McGraw looking beyond music". Today. Retrieved 27 November 2013. ↑ Mansfield, Brian; Thom Jurek. "Tim McGraw - Tim McGraw". Allmusic. Retrieved 8 March 2010. ↑ Keith Palmer (CD insert). Keith Palmer. Epic Records. 1991. 48611. 1 2 Gerome, John (April 13, 2007). "Growing Strong – McGraw's reach encompasses country music, more". San Angelo Standard Times. Archived from the original on April 26, 2007. Retrieved April 23, 2007. 1 2 3 4 "Tim McGraw Album & Song Chart History - Country Songs". Billboard. Prometheus Global Media. Retrieved February 2, 2012. ↑ "Controversy: Episode "Indian Outlaw"". Country Music Television. 2003. Retrieved April 23, 2007. 1 2 3 4 5 "Tim McGraw Biography". CMT. Retrieved March 15, 2007. ↑ "Year End Charts - Year-end Albums - Top Country Albums". Billboard.com. Archived from the original on 2007-12-11. Retrieved 2009-08-26. ↑ "Faith Hill". InternationalSpeakers.Com. Archived from the original on January 10, 2007. Retrieved April 23, 2007. ↑ "40th Annual Grammy Award Nominations". DigitalHit.com. Retrieved March 31, 2013. ↑ "Year End Charts - Year-end Singles - Hot Country Songs". Billboard.com. Archived from the original on 2007-12-11. Retrieved 2009-08-31. 1 2 3 4 5 "Tim McGraw and the Dancehall Doctors – Bio". Liner notes for album Tim McGraw and the Dancehall Doctors: Curb Records. 2001. ↑ Ryan, Harriet (March 14, 2001). "The singers, the deputies, and a horse". CourtTV. Archived from the original on June 30, 2007. Retrieved March 15, 2007. ↑ Tyrangiel, Josh (September 13, 2004). "The Clinton of Country". Time Magazine. Retrieved March 15, 2007. ↑ Susman, Gary (December 4, 2003). "Grammylicious". Entertainment Weekly. Retrieved 2009-04-23. ↑ McNary, Dave (December 12, 2004). "'Dying' for a deal". Variety. Retrieved April 3, 2007. ↑ "Nelly's 'Over & Over' Jumps To No. 1!". SixShot. November 9, 2004. Archived from the original on September 28, 2007. Retrieved March 15, 2007. ↑ Kelley, Austin (October 10, 2005). "Pigskin Poet". The New Yorker. Retrieved March 15, 2007. ↑ "Tim McGraw owner of Arena Football Team". USAToday. November 2, 2004. Retrieved March 15, 2007. ↑ "Tim, Faith set tour mark". Country Standard Time. September 14, 2006. Archived from the original on March 12, 2007. Retrieved March 15, 2007. ↑ "Tim McGraw and Faith Hill concert to benefit Katrina relief". Country Standard Time. May 12, 2006. Retrieved March 15, 2007. ↑ "Let It Go - Tim McGraw -- Billboard.com". Retrieved September 5, 2009. ↑ "Tim McGraw's Special Tribute". Gactv.com. Retrieved 2011-10-22. ↑ "Tim McGraw's "If You're Reading This" Is In High Demand – Engine 145". Engine145.com. 2007-05-25. Retrieved 2011-10-22. ↑ "Nomination's For 50th Annual Grammy Awards.". eonline.com. 2007-12-06. Retrieved 2012-11-01. ↑ "First new music in over two years on horizon for McGraw". Country On Demand. Archived from the original on July 3, 2009. Retrieved June 28, 2009. ↑ Waddell, Ray. "Touring Over a New Leaf: With New Managers and Ambitious Concert Plans, Tim McGraw Isn't Resting on His Laurels". Billboard - The International Newsweekly of Music, Video and Home Entertainment Sep 19 2009: 20-3. ProQuest. Web. 19 July 2015 . ↑ "Tim Announces 2011 'Emotional Traffic' Tour Launching This Spring With Special Guests Luke Bryan And The Band Perry". Tim McGraw.com. January 2, 2011. Archived from the original on 2011-01-05. ↑ "Tim to Headline Special Concert for SiriusXM, Launch 'Tim Mcgraw Radio' Channel & Air Concerts From 2011 Tour". Tim McGraw.com. March 29, 2011. ↑ "Tim McGraw Laments Label's Hold on Upcoming Album". The Boot. 2011-04-20. Retrieved 2011-10-22. 1 2 "Curb Records Files Breach-of-Contract Suit Against Tim McGraw". Billboard. May 16, 2011. ↑ "Tim McGraw Files Counter Suit Against Curb Records". Billboard. May 24, 2011. 1 2 "Tim McGraw wins legal battle with Curb". The Tennessean. Nashville. November 30, 2011. 1 2 "Court Says Tim McGraw Is Free to Record and Shop for Another Label". CMT. November 30, 2011. Retrieved December 1, 2011. ↑ "New Tim McGraw Single Released by Curb". CMT. December 1, 2011. Retrieved December 1, 2011. 1 2 "Tim McGraw's 'Emotional Traffic' Finally Has Release Date". TheBoot.com. December 2, 2013. Retrieved March 31, 2013. ↑ "Tim McGraw Signs With Big Machine". Billboard. Retrieved 2013-02-05. ↑ Geller, Wendy (October 31, 2012). "Tim McGraw Announces Title, Release Date For New Album; Performing New Single At CMA Awards". Yahoo! Music. Retrieved March 31, 2013. ↑ "THEY HEART JOSH!!". HITS Daily Double. February 12, 2013. Retrieved March 31, 2013. ↑ "Tim McGraw, Carrie Underwood Set to Headline London's First-Ever Country to Country Music Festival". Taste of Country. 10 December 2012. Archived from the original on 10 December 2012. Retrieved 11 December 2012. ↑ "Tim McGraw Announces 2014 Tour: Sundown Heaven Town!". CountryMusicNewsBlog. January 14, 2014. Retrieved January 14, 2014. ↑ Dukes, Billy (April 3, 2014). "Tim McGraw Announces 'Sundown Heaven Town' Album". Taste of Country. Retrieved April 4, 2014. ↑ Jurek, Thom. "Love Story – Tim McGraw". AllMusic. Retrieved February 22, 2014. ↑ "Tim McGraw Announces New Album 'Damn Country Music'". Billboard. September 17, 2015. Retrieved September 17, 2015. ↑ Dukes, Billy (October 4, 2016). "Tim McGraw and Faith Hill Announce 2017 Soul2Soul World Tour". Taste of Country. Taste of Country Network. ↑ Dillon, Charlotte. "Jo Dee Messina". Allmusic. Retrieved 3 February 2015. ↑ Wilonsky, Robert (October 7, 2004). "Hell of a Catch". The Dallas Observer. Retrieved March 26, 2007. ↑ Weinstein, Joshua L. (May 22, 2006). "Hollywood via Nashville". Variety. Retrieved April 3, 2007. 1 2 "Flicka". Box Office Mojo. Retrieved March 26, 2007. ↑ McCarthy, Todd (October 17, 2006). "Flicka". Variety. Retrieved March 26, 2007. ↑ Hartlaub, Peter (October 20, 2006). "McGraw alone can't rein in unruly 'Flicka'". The San Francisco Chronicle. Retrieved March 26, 2007. 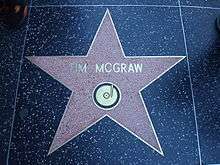 ↑ "Tim McGraw Receiving Star on Hollywood Walk of Fame". CMT. September 14, 2006. Retrieved March 15, 2007. ↑ "Briefly: Tim McGraw, Master P, Silkk the Shocker, Pete Doherty". LiveDaily. Archived from the original on 2008-06-08. Retrieved 2011-10-22. ↑ "Country Strong Hits Hollywood". Us99country.radio.com. Retrieved 2011-10-22. 1 2 "Awareness". TimMcGraw.Com. 2007. Archived from the original on July 9, 2007. Retrieved March 15, 2007. ↑ Gordon, Dan; Buck Wolf (March 8, 2006). "Faith Hill, Tim McGraw Blast 'Humiliating' Katrina Cleanup". ABC News. Retrieved March 15, 2007. ↑ "American Red Cross National Celebrity Cabinet Members". The American Red Cross. 2007. Retrieved March 15, 2007. ↑ "Favre's golf tourney a success for QB, charity". Official Website of Brett Favre. April 5, 2005. ↑ John Bumgardner, Jessica Puchala (July 13, 2007). "Country Music Couple Donates $5,000 to Kozminski Fund". Grand Rapids Police Officer Robert Kozminski. ↑ "Country, Rock Stars Join For 'Nashville Rising' Benefit". Billboard. 2009-09-14. Retrieved 2011-10-22. ↑ "Gov Tim McGraw?". antiMUSIC News. 2008-01-03. 1 2 "Tim McGraw Likes the sound of Gov. McGraw". MSNBC. January 13, 2006. Retrieved March 15, 2007. ↑ "Tim McGraw: The Two Sides of Tim". People. September 10, 2008. ↑ "Tim McGraw Biography". Bio. Retrieved 2015-02-23. ↑ Bob Paxman (2013-01-28). "Tim McGraw Talks to "Town Hall" Fans". Country Weekly. Retrieved 2015-02-23. ↑ "Cirrus Owner: Tim McGraw". YouTube. Retrieved 2015-02-23. ↑ "Tim McGraw". Forbes. 2015. Retrieved 28 April 2016. ↑ "Tim McGraw Awards". Curb Records. 2007. Retrieved March 15, 2007. Wikimedia Commons has media related to Tim McGraw.